Location: Museum für Kunst und Kulturgeschichte, Dortmund. In this contemplative scene, near the viewer a man is leaning back against a boulder and gazing up the crucifix in front of a cluster of young fir trees. He has flung his crutches demonstratively far away from him into the snow. He leans against a sturdy rock, raising his hands in prayer before a crucifix gleaming against the vigorous evergreen branches of young fir trees. On the horizon the facade and spires of a Gothic church, whose silhouette echoes that of the firs, rise like a vision out of a bank of mist. Shoots of grass push through the snow, and the sky is streaked with the glow of dawn. This combination of motifs has been interpreted as a reference to the security of the Christian in his faith, into the hope of resurrection, and the salvation vouchsafed through Christ's sacrifice on the cross. 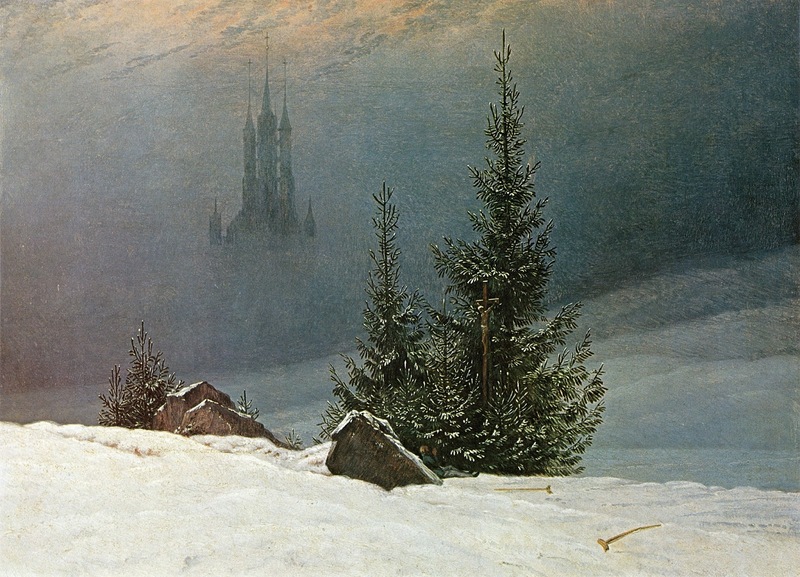 'Winter Landscape' was painted with surprisingly few pigments, suggesting that Friedrich was less interested in color than in smoothly graduated tones. He achieved the striking effect of shimmering, transparent haze by careful stippling with the point of the brush, using a blue pigment - smalt - which is transparent in an oil medium. Caspar David Friedrich (1774 - 1840) is considered to be the greatest German Romantic painter and one of the most original geniuses in the history of landscape painting. Born at Greifswald on the Baltic coast, he studied in Copenhagen until 1798 before settling in Dresden. He came of age during a period when, across Europe, a growing disillusionment with an over-materialistic society led to a new appreciation for spiritualism. This was often expressed through a re-evaluation of the natural world, as artists such as Friedrich, J. M. W. Turner and John Constable sought to depict nature as a "divine creation, to be set against the artifice of human civilization", and to convey the spiritual experiences of life. Friedrich is best known for his later allegorical landscapes, which feature contemplative figures silhouetted against night skies, morning mists, barren trees, and Gothic ruins. His primary interest as an artist was the contemplation of nature, and his often symbolic and anti-classical work seeks to convey the spiritual experiences of life.